With the dietary supplements impacting our daily life, a lot of people find it quite challenging to survive without them. 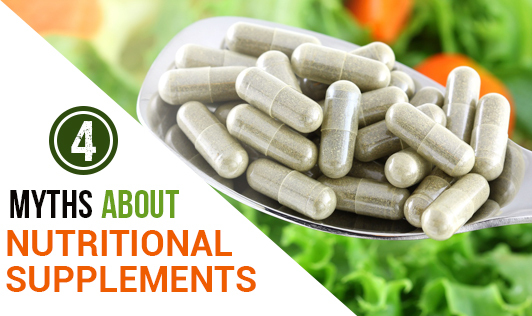 Some companies proclaim that these supplements act like miracle pills or powders and can help you overcome nutrient deficiencies. While there is no denying that nutritional supplements are necessary in some cases, it is also true that an excess of anything is not good. It is therefore, necessary to exercise caution while taking any supplement. Myth 1: Everyone needs extra protein. Fact: Protein requirement can be easily met by eating a balanced diet of fish, poultry, dairy, nuts, and pulses. Adults who need more protein because of athletic training or a medical condition can use protein shakes to make up for their dietary intake. If you do not need extra protein, excess consumption and long-term use of protein powders may prove to be harmful. Myth 2: Supplements are helpful for losing weight. Fact: Herbal weight loss products make false claims by promising fast weight loss. However, none of these herbal supplements work and some of them could have some serious side effects. Only regular exercises and healthy diet would make the best recipe for effective weight loss. Myth 3: More vitamin and mineral supplements always means better. Fact: Any person could easily have hypervitaminosis if he or she has too many vitamins and minerals. People get most of their requirements from daily meals. But in case of sickness and malnutrition, there could be a need for multivitamin doses. Myth 4: Supplements with added enzymes are easier to digest. Fact: Supplements with added enzymes to aid digestion are unnecessary. The body makes its own digestive enzymes. However, lactase enzymes do assist those who have lactose intolerance. Supplements are good but not always necessary and dosage is a major factor to consider before starting on any kind of supplementation. What may work for one individual may not work for someone else. This makes it vital to consult a doctor before popping a vitamin pill or adding protein powder to your daily morning smoothie. Be sure and be safe!